At Canadiandollarbingo.com new players receive an amazing 1000% in bonuses over the first two deposits made - that's 600% on the first and a further 400% on the second. Those bonuses ensure plenty of opportunities to start exploring the site and getting to know what it is all about without breaking the bank. Meet our friendly chat hosts team that will keep you entertained while the jackpots will keep your adrenaline running high. When you make a first-time deposit 500% in bonus is credited immediately and the other 100% is claimed via the chat room. The same is true of the second time deposit bonus - 300% is immediate and the final 100% claimed in chat. 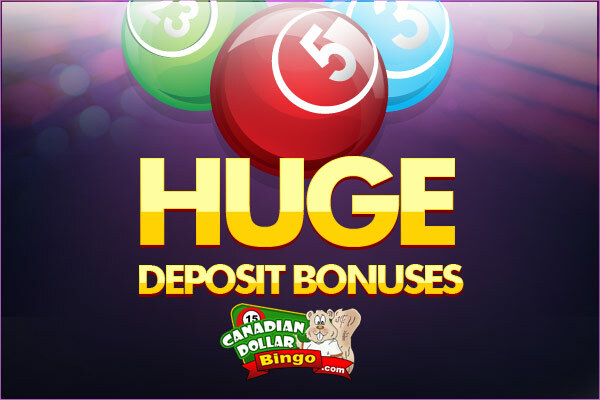 In another unique feature, Canadiandollarbingo sets no upper limit on the amount that can be deposited and still qualify for the bonus. At Canadiandollarbingo we also believe in loyalty. This is why we reward players with the most generous Loyalty Program in the web. Starting on your 3rd deposit our Loyalty Program will reward you with up to 800% Bonus on EVERY deposit you make! Plus! Daily reload offers worth up to 350% EXTRA credited on top of all regular bonuses you get and is available to all qualified players.